Equipment for the thorough and consistent mixing of no-time dough for specialty and artisan-style bread, as well as a full selection of other bakery products, including rolls, buns and pizza bases. A range of mechanical dividers offering high accuracy, rock-solid reliability and extremely low cost of ownership. Equipment that accepts divided dough pieces and forms them into ball shapes for easier handling and better presentation to Provers, which rest the dough before moulding. While Baker Perkins' mixing and forming equipment is typically installed as an integrated, automated line in high-output tin and pan bread plant bakeries across the globe, the equipment is also suitable for many other bakery and hearth bread products. Baker Perkins' selection of mixing and forming unit machines enables bakers to meet increasing market demand for quality, premium products across all bakery sectors. The Tweedy™ 8 and Tweedy™ 20 have applications in artisan-scale bakeries, as well as within the bagel, pastry and other bakery sectors. The mixers can also be used by high-output bakeries for development work on new products, as well as ingredient suppliers working on new formulations, and research or academic institutions studying high speed mixing and other aspects of the bread making process. The Versatex Mixer is a vertical spindle mixer with a removable bowl, suitable for a maximum batch size of 100kg of dough. 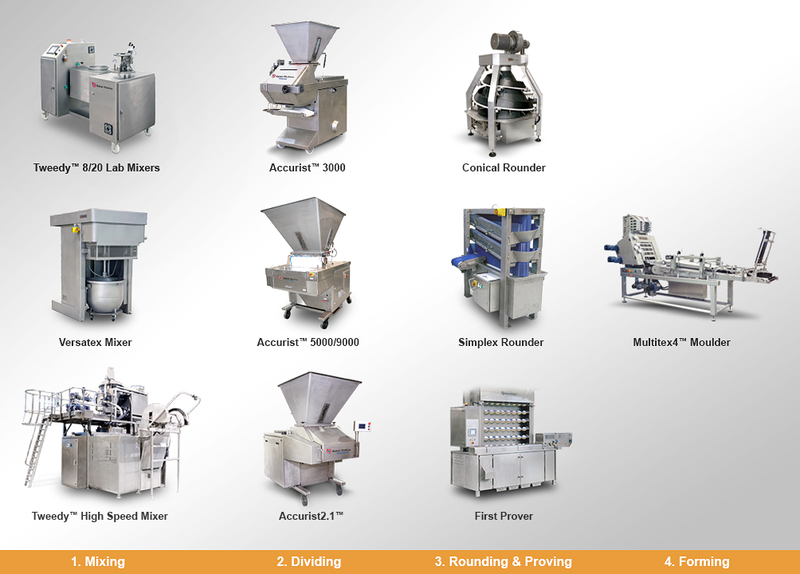 The range of Tweedy™ mixers covers the industry, from small through medium to large scale plant bakeries. Several integral features make the Tweedy™ process ideal for many products, including pizza, baguette, focaccia, ciabatta, batter, rye, soda, pita and artisan breads, brioche, breadcrumbs and Panko, bagels, cinnamon rolls and burger buns. Accuracy, reliability and low cost of ownership are the hallmarks of Baker Perkins’ Accurist™ dough dividers. They are durable, easy to operate and maintain, and there is a wide range of piece-weight and output combinations available, covering applications as diverse as small breads and pizza bases up to large loaves. All Accurist™ dividers are capable of maintaining an accuracy of 2.5 to 3.5g Standard Deviation on 900g dough pieces over extended production runs. 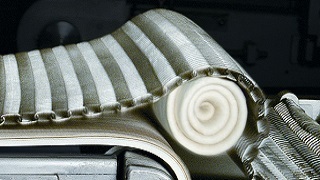 The Accurist™ 3000 divides dough between 1-4 pockets, and can handle from 500 up to 6,000 pieces per hour. The Accurist™ 5000 and 9000 divide dough between 2-8 pockets, and can handle between 1,200 to 14,400 pieces per hour. The Accurist2.1™ can handle from 1,200 to 14,400 pieces per hour between 3-8 pockets; it also incorporates a full foam-and-rinse washdown function for added hygiene. Baker Perkins’ Rounders form divided dough pieces into ball shapes for easier handling and better presentation to Provers and Moulders. They gently roll the dough pieces using open trough profiles to preserve the internal dough structure. As well as forming the ball shape, the process also conditions the surface of the dough pieces for easier handling downstream. The Conical Rounder can handle larger piece weights, ranging from 300g to 1,760g. Baker Perkins’ First Prover accepts dough pieces from Rounders and relaxes them prior to final moulding. Removing stress from the dough ensures that it can be moulded without tearing and will prove and bake evenly. Using a First Prover enables the resting to be carried out in a controlled, hygienic environment that preserves the rounded shape and provides a well-controlled feed to the moulders. Baker Perkins offers the Multitex4™ final moulder to bakeries looking to sheet and mould dough pieces for pans / tins. Gentle sheeting and moulding enables dough quality to be maintained while reducing the use of costly ingredients such as yeast and improvers. The dough is subjected to controlled, even tension during sheeting and moulding, so it proves evenly and fills the pan well to give an attractive appearance and good crumb structure.